Come through the Castle Store and enter a magical world of friendly animals and Enchanted Forest treasures. While in the store, you can find children's toys and books, Enchanted Forest souvenirs, our farm-raised 100% grassfed beef and pastured pork, and other locally-produced foods to take home and enjoy. Written by Janet Kusterer & Martha Anne Clark (published August 2013). The history of the Enchanted Forest is one of magical beginnings. 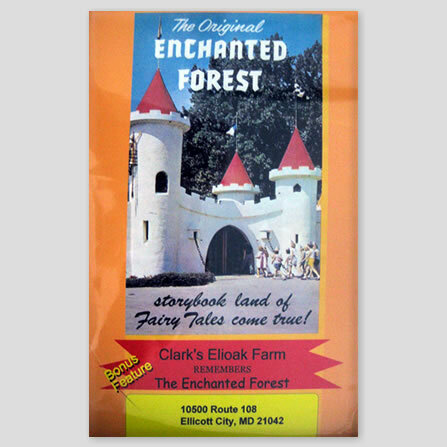 When it first opened in 1955, Ellicott City's storybook land became the first children's theme park on the East Coast. Young visitors could climb aboard rides like the Little Toot tugboat, Mother Goose and Ali Baba or encounter animals like peacocks and burros. 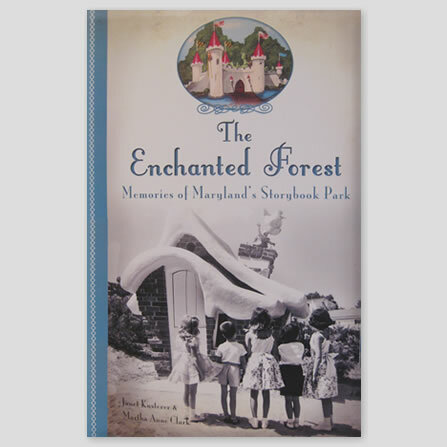 Upon its closing in 1989, Marylanders who cherished memories of the Enchanted Forest were deeply disappointed. However, many of the park's beloved figures were moved to nearby Clark's Elioak Farm, where they were restored and displayed to the delight of new generations. Even today, the farm is a popular destination that evokes the whimsical spirit of the iconic park. Local author Janet Kusterer and Martha Clark of Elioak Farm trace the park's history through vintage images and interviews with the Harrison family, former employees and visitors. Join Kusterer and Clark to rediscover the magic of the Enchanted Forest. Taken in May 1987, this DVD takes you on a 60 minute walking tour of each building and ride. 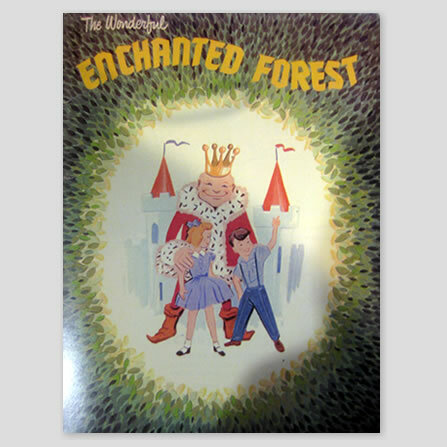 There is a short introduction about the history of the Enchanted Forest. Keep in mind that the footage was taken on a home video camera and transferred to DVD, so at times the footage is a little distorted. The DVD was remastered in 2009 at which time additional footage was added from Clark's Elioak Farm. This Bonus Feature includes a 25 minute walking tour of the petting farm and a view of many of the Enchanted Forest attractions that have been moved to Clark's Elioak Farm and restored to their former glory. Take a walk down memory lane, enjoying all of the wonderful features from the Enchanted Forest that you remember from your trips to the park, and then end up at our farm. What could be better?!! 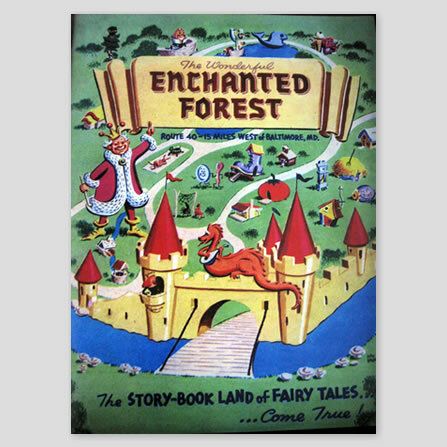 The Enchanted Forest Story Book has been reproduced from the original and is now once again available for sale. It begins, "Mother Goose was unhappy! All the friendly folk of Mother Goose Land lived so far apart! Why, Little Boy Blue had his haystack way down in Farmer Brown's field. Little Miss Muffett sat on her tuffet still farther away. As for the Old Woman who Lived in a Shoe, she had moved to the city, and Mother Goose hardly ever saw all those children. So ... Relive your childhood, with this adorable children's story book. Our favorite goat, Eli, invites you to read this story about Trusty the Tractor. Trusty pulls the hayride at Clark's Elioak Farm but dreams of doing the jobs that the bigger tractors do. One day he gets a chance to "save the day"--but is he too little to do the big tractor's job. Read along with Eli and see what happens on the farm. Oh no, Clark's Elioak Farm's favorite goat, Eli, is on a great adventure and he is taking the other goats with him! 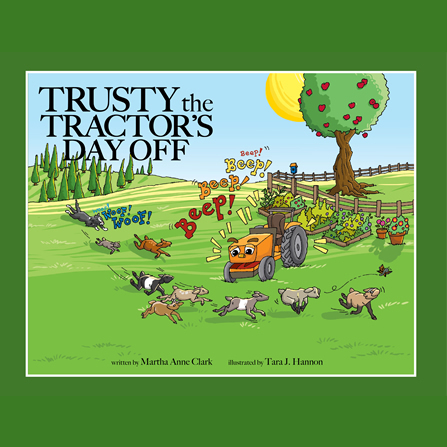 What is Trusty the Tractor going to do to keep them from getting into trouble? Read along with Eli and see what happens on the farm. It's a very busy "day off" for Trusty. You can also find a butterfly on each page. 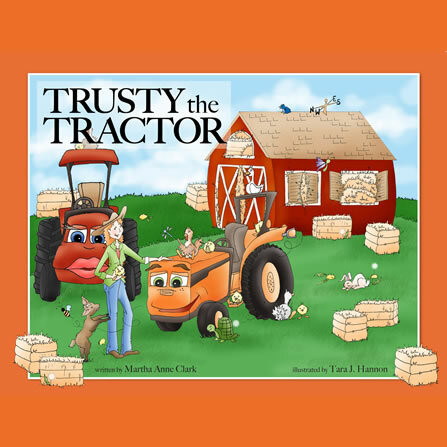 Join Trusty the Tractor on his second farm adventure, and along the way, visit all of your favorite places and animals at Clark's Elioak Farm once again! 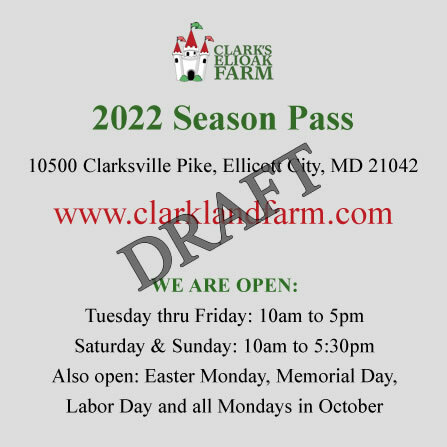 2019 Season Passes can be purchased at the Castle Store when you are visiting the Farm or at our Online Store. The Season Pass covers Admission only. The Pass covers Immediate Family only—parents and children. A grandparent or nanny can substitute for the parent for visits when the parent cannot come. Order your Season Passes here! 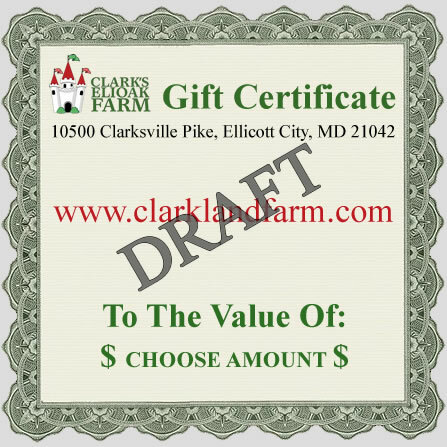 Order your Gift Certificates here!